Barry must race to Iron Heights and protect the inmates from Godspeed, including the very man responsible for his mother’s death. While this might be a harder task to grapple with for anyone else, The Flash has never considered killing Zoom for what he did to Nora and wouldn’t want anyone else to take his life unlawfully either. 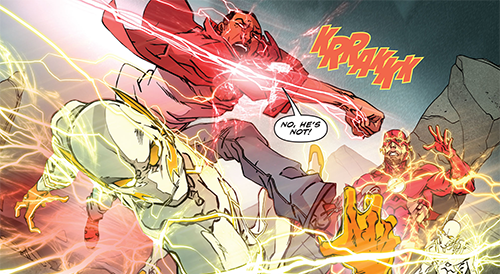 Not only do Flash and Godspeed have very different takes on the sanctity of life, but Barry also has a very different approach to the speed force than his nemesis. Barry’s scientific knowledge helps slow August down, but he needs a partner in order to truly stop him. And that’s where the heart of the story comes in, as Wally West rushes to his mentor’s rescue and in the process gets his new speed suit. Once the two speedsters run together, Godspeed is finally taken down without any bloodshed. 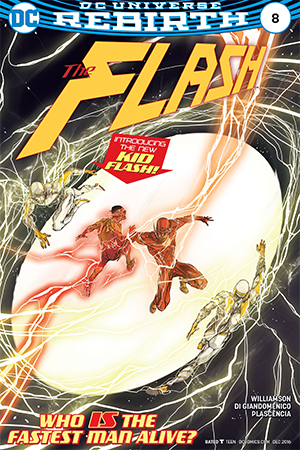 Just as the last issue of The Flash explored August’s philosophy and motivations, this one touched on Wally’s. He learns to temper his passion with justice from Flash, but his inspiration for helping others in the first place is his aunt Iris. Joshua Williamson has said he loves the idea of family in The Flash, and that is evidently on display here. 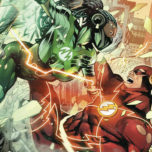 Even though Barry, Iris and Wally West are not a traditional family at the moment – the way that Wally takes lessons from both authority figures he admires in order to fashion a new identity for himself is a great representation of that. Not to mention how satisfying it was for Wally to finally come clean with his aunt after months of secrecy. There are still a few reveals left, but the honest conversation between them thankfully made it clear that this run won’t be following old comic book tropes. 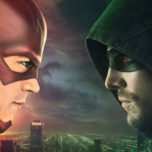 The moments between Barry and August feel equally as earned as the ones between Wally and Iris, which is a credit to Joshua Williamson’s skill. 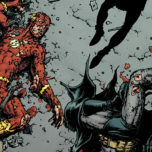 Over the course of 8 issues, he made their friendship believable enough that the loss of it was understandably devastating not just to Barry, but to the reader as well. His final warning is chilling on its own, but also sets up an interesting arc for the future that will hopefully be tackled sooner rather than later. The art for the last few issues has been outstanding, especially when it comes to the action sequences. Carmine Di Giandomenico seems to understand the speed force as intimately as Barry himself does, and Ivan Plascencia’s colors continue to make the lightning come alive. Steve Wands’ lettering is also to be commended – he makes sound effects pop off the page without distracting from the aesthetic of the speedster battles. It took a little longer to get accustomed to the art when it came to characters going about their daily business, but the effect is much more satisfying when the impossible clashes with the quotidian. 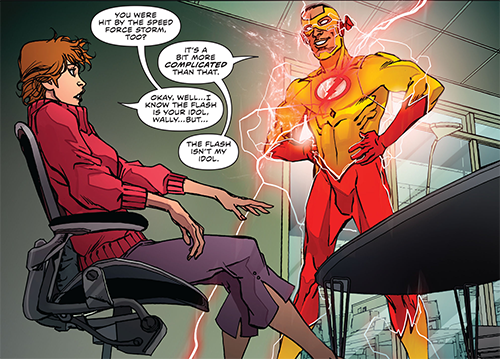 Wally West in all his suited glory doesn’t feel out of place in Iris’ office, but the lightning around him focuses the eye and makes the irresistible call of the speed force that much clearer. Verdict: 4.5 out 5 stars. The Godspeed arc concludes with almost as many questions as it answered, but the result is not at all unsatisfactory. 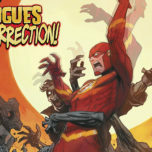 Doors to new avenues of storytelling are left tantalizingly open, hints for the next standalone issue are dropped organically, and the theme of family takes Barry back to the Rebirth story that opened this run of The Flash. Most importantly, every major character gets a chance to shine before the book is closed on this arc – for now.